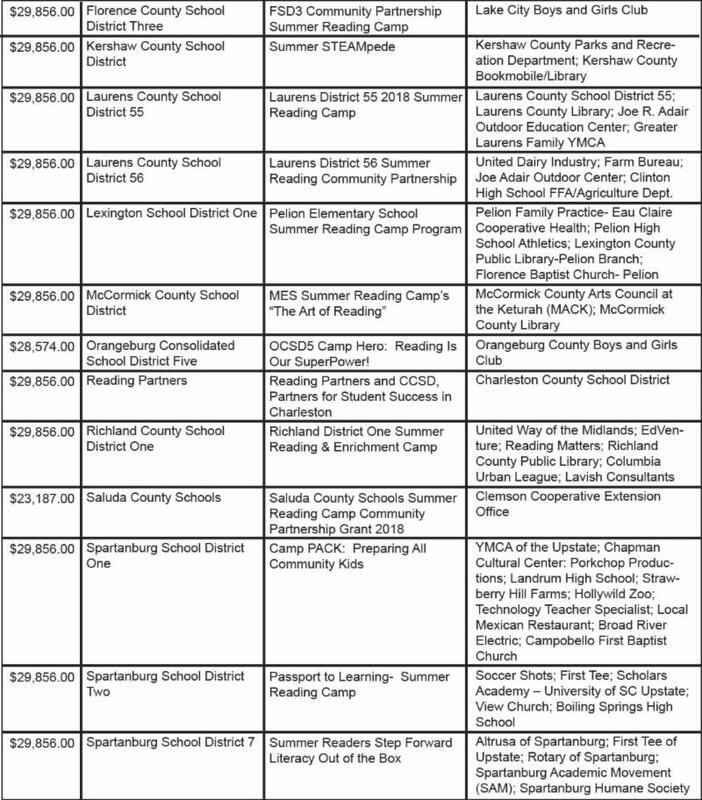 School District's 56, Clinton, and District 55, Laurens, will receive $29,856 each to operate summer reading camps. The announcement was made today by the SC Department of Education. The announcement said 24 districts will receive a total of $700,000. The District 56 Summer Reading Community Partnership includes United Dairy Industry, Farm Bureau, the Joe Adair Outdoor Education Center, and Clinton High - FFA - Agriculture Department. 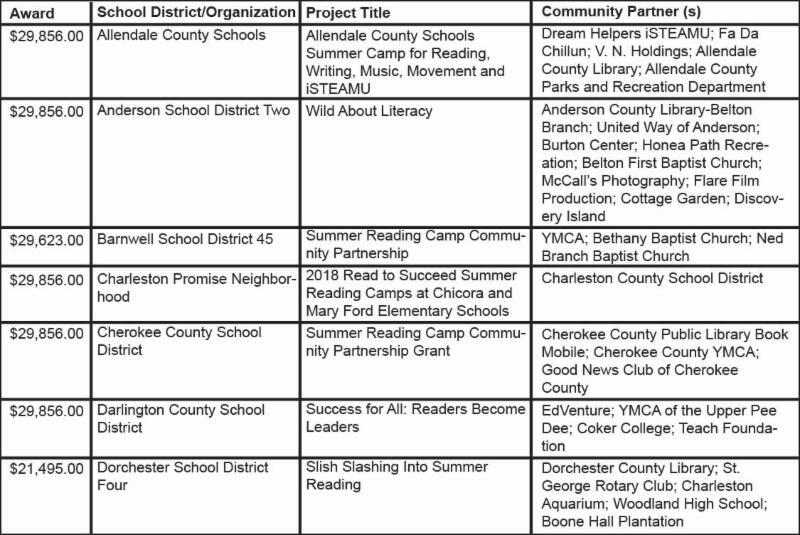 Columbia, S.C. - State Superintendent of Education Molly Spearman announced that 24 school districts and community organizations will receive $700,000 through the Summer Reading Camp Community Partnership Grant. The Summer Reading Camp Community Partnership Grant is funded by an appropriation from the South Carolina General Assembly and aims to expand the existing summer reading camps, which provide elementary school students who are working toward grade level reading proficiency with the opportunity to receive quality, intensive instructional services. The 2017-2018 school year is the first year in which a student must be retained in the third grade if the student fails to demonstrate reading proficiency on the state summative reading assessment SC READY. Successful completion of a summer reading camp is one of seven good cause exemptions from mandatory retention provided in the state’s Read to Succeed legislation. For students to benefit from the summer program, they must attend regularly and be engaged in instructional and hands-on learning experiences. Grant sites strategize ways to increase consistent student attendance through collaborative partnerships between local community organizations and school districts. Funding is authorized by the 2017 General Appropriations Act, Act 97, Proviso 1.59 (SDE: Summer Reading Camps). 1.59 (SDE: Summer Reading Camps) For the current fiscal year, funds appropriated for summer reading camps must be allocated as follows: (1) up to twenty percent to the Department of Education to provide bus transportation for students attending the camps; (2) $700,000 allocated to the department to provide grants to support community partnerships whereby community organizations shall partner with local school districts to provide enrichment activities as part of after school programs or summer reading camps that utilize volunteers, mentors or tutors to provide instructional support to struggling readers in elementary schools that have a poverty index of forty percent or greater based on the poverty index utilized the prior fiscal year that was student eligibility for the free or reduced price lunch program and Medicaid. All mentors and tutors that are a part of these after school programs or summer reading camps must have passed a SLED criminal background check. Participant to volunteer or teacher ratio must conform to that of the school district in which the program is located; and (3) the remainder on a per pupil allocation to each school district based on the number of students who substantially failed to demonstrate third-grade reading proficiency as indicated on the prior year's state assessment as defined by Section 59-155-120 (10) of the 1976 Code.